Meet yet another local. This guy makes hunting horns. 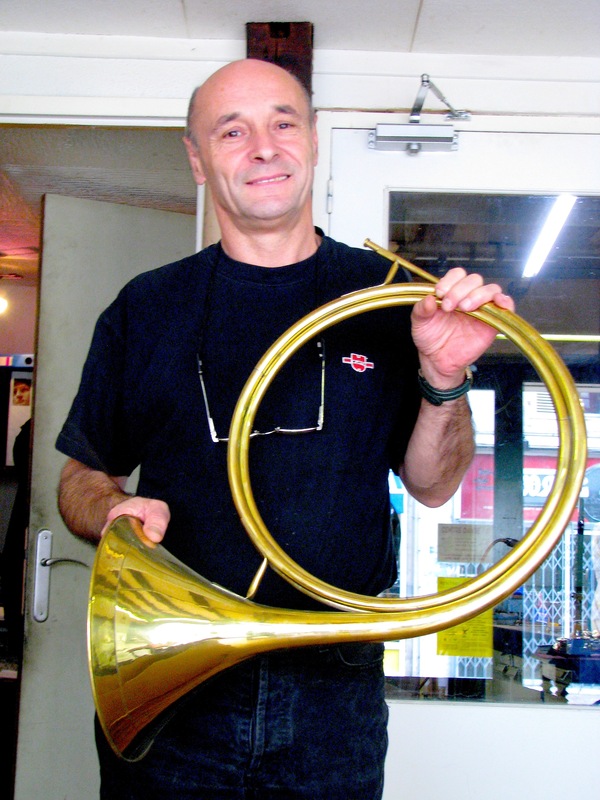 He is (or was) the last maker of hunting horns in France, and I lived next door to him. « Facteur » – postman (Brit), mailman (US). « Facteur de piano » ? No, it is not what you think. What is a « piano factor » anyway? « facteur de trompe de chasse » will make hunting horns. 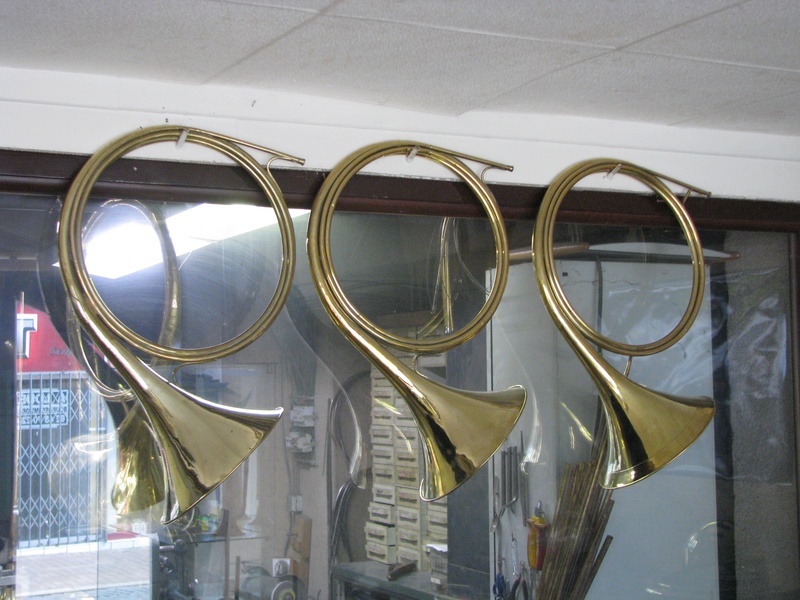 Piano and organ makers are in the dictionary, but hunting horn makers aren’t, perhaps because there are not actually many people left making hunting horns. From mouthpiece to trumpet, there are four and a half metres of brass tube in a French hunting horn. Forget the bugle-trumpet style horns you may see on an English hunt, the French horn looks like a French horn (referred to as such by the English). Is there much call for hunting horns? In the age of the mobile phone, surely there are more modern means of communicating between hunters? Horns are still used frequently on hunts. They are the quickest and simplest way of sending messages over long distances. Whether hunting on horseback with hounds in the « vieille tradition » or just a day’s shooting, on every hunt there are always « sonneurs » or « horn blowers » whose job it is to accompany the hunters and sound their horns to inform everyone on the « state of play ». There are literally hundreds of horn calls that punctuate the hunt, « codes » sounded by the « sonneur » to mark the various moments, from the first sight of game, through the chase to the final kill. The calls change depending on where you are hunting and what your are hunting. Hunting though is a dying past time. There are still 1.3 million « chasseurs » in France, but they are an aging breed. In these politically correct times, the flow of new blood into the hunting fraternity has reduced to a mere trickle. Young people consider hunting as barbaric, however hunters play an important in the eco-management of rural France. Be it real hunting or mere « pest control », horns still have a vital role to play. Apart from hunting, there is a demand for « ceremonial » horns, favoured at society weddings. When local dignitaries or aristocrats get married, it is traditional, and very posh to have a group of horn blowers decked out in full hunting regalia to play at the wedding. Nowadays though, Monsieur Picard’s main trade comes from repairing and restoring other brass instruments, everything from trumpets and saxophones through to tubas. However if you want a horn to play or merely hang above the fire place Mr Picard will lovingly craft you one in under a week for a mere 1600€, or 1900€ if you want something a little more decorative. Finally, something that has been intriguing me. What about the shape of the horn? Is there a historical reason? « It’s so you can sling it over your shoulder » laughs Monsieur Picard.